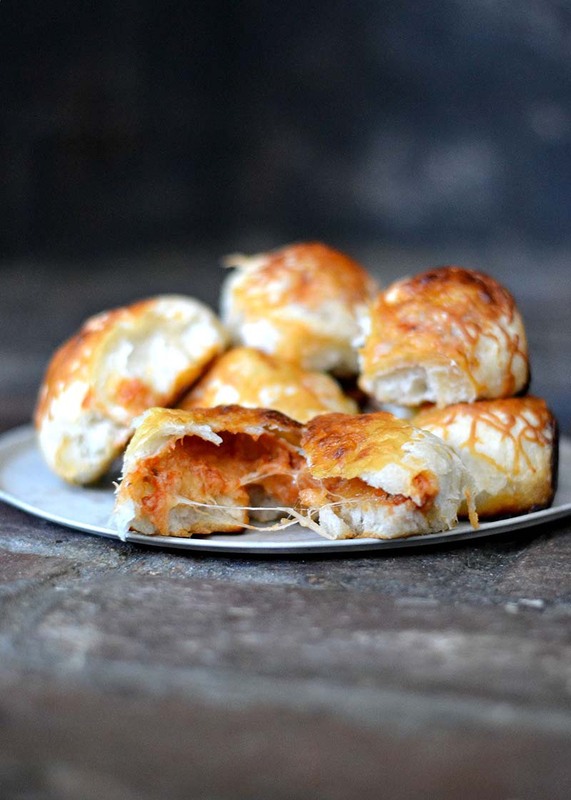 Chewy pizza dough made into dinner rolls, filled with extra cheese, sauce and any of your favorite pizza toppings. In a small bowl combine warm water with yeast, and set aside until foamy. Once the yeast is ready, combine 1½ cups of flour, honey, salt, olive oil and yeast mixture together in a mixing bowl. Stir together with dough whisk or wooden spoon. Add in additional flour (1 tbsp at a time), if the dough appears to be too sticky. Once dough comes together and is just barely sticky, knead on a lightly floured surface until it is nice and elastic. About 6-8 minutes. Place dough in a greased mixing bowl, cover with a dish towel and set in a warm place to rise until doubled in size. About 15-30 minutes. Once dough has risen, punch down and separate into about 8 equal sized balls. Carefully stretch each ball, just as you would a pizza, until it is about 3 inches across. Do not stretch too thin, or else the dough will rip in the center. In the center of each of your “mini pizzas” place a small dollop of pizza sauce and top with a small mound of shredded mozzarella cheese. Carefully bring the sides of the dough up, pinching together and enclosing the sauce and cheese. Once sealed, place seam side down in a greased pie plate or cake pan. After all of your rolls are assembled, top with any remaining cheese. Bake at 375°F, for about 20 minutes or until they are golden brown. You can dip rolls in extra sauce if desired, or add your favorite pizza toppings to the cheese and sauce mixture before baking.